Diplomat is a game that takes the core game play of Authors (Go Fish) and runs with it—rather than just asking if someone has a card or not, you may ask anything so long as it can be answered with a yes or a no! This makes for some very strategic play as the players try to whittle down the possibilities of cards in their opponents’ hands. Diplomat is a simple enough game that pretty much anyone can learn it, but experienced players will generally do better at it. It can be played by three to six players. The object of Diplomat is to be the player to collect the most books (sets of four of a kind). Diplomat is played with one standard 52-card deck. 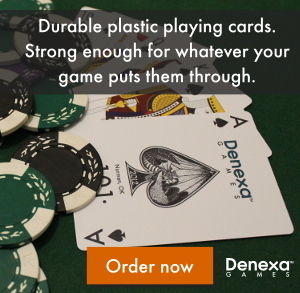 We’d like to diplomatically recommend that you use Denexa 100% Plastic Playing Cards in your game. Shuffle and deal the entire deck out, one at a time, as far as it will go. Place any remaining cards face-up in the center of the table. The player to the left of the dealer goes first. 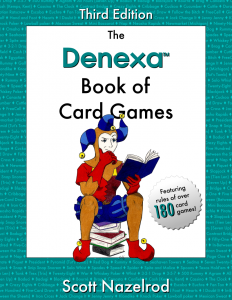 On their turn, if a player can form a book (four of a kind) from the cards in their hand and any cards that are face-up on the table, they may collect all four cards, reveal them to the other players, and then discard card them face-down in a pile in front of them. Books may be played at any time on the player’s turn. And so on. The named player must truthfully answer the question yes or no. (There is no bluffing in Diplomat!) If the question is answered “yes”, the active player may continue asking questions. If they receive a “no” answer, their turn is over immediately. If a player suspects that they have identified a particular card in a player’s hand, they may ask them to lay it out, e.g. “Jen, can you lay out the jack of diamonds?” If the player has the card name, they lay it face-up in the center of the table, where it can be used by any player to complete books. If not, they simply say “No,” and the turn passes as usual. Game play continues until all thirteen books have been assembled. The player with the most books is the winner.